What constitutes contemporary Indigenous art? Who gets to answer that question? Who tells stories in this country, and what version of history are they representing? In 1994 Wesley Enoch was the Artistic Director of Brisbane-based Kooemba Jdarra Indigenous Theatre which was founded in 1993 and finished producing work in 2007. He and actor Deborah Mailman premiered their groundbreaking 7 Stages of Grieving for the company in 1995. Enoch, a director and playwright, went on to become Resident Director with the Sydney Theatre Company, Artistic Director of Melbourne’s Ilbijerri Aboriginal and Torres Strait Islander Theatre Co-Operative, Associate Artistic Director with Company B Belvoir St, Artistic Director of the Queensland Theatre Company and is currently Artistic Director of Sydney Festival and a well-known commentator on Indigenous and other issues. 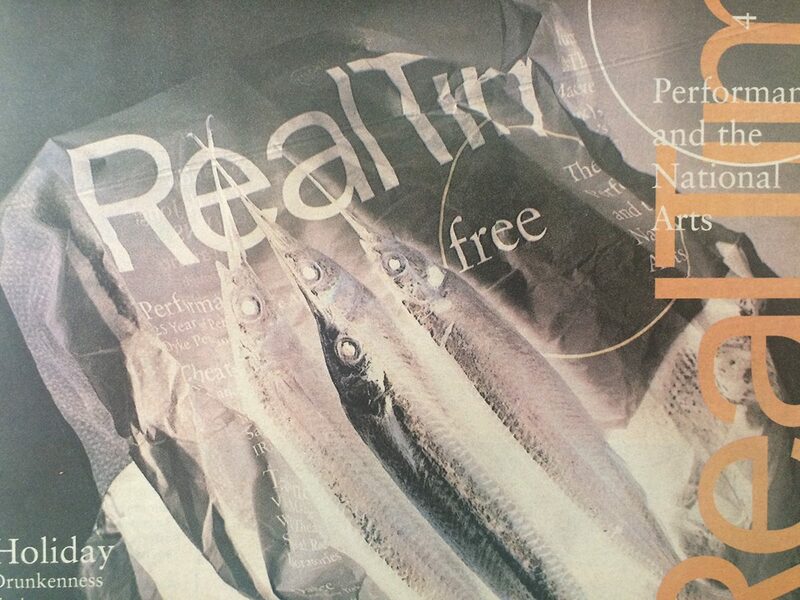 In the 1990s he wrote occasionally for RealTime and was part of a RealTime team of writers commissioned by LIFT (London International Festival of Theatre) to respond to its 1997 program alongside local writers. The limitations described by Enoch in 1994 on Indigenous access to “meaning-making” in dominant Western culture have been forcefully challenged by Indigenous artists and companies in the two decades since, sometimes reaching large audiences, though not consistently. There are only two Aboriginal theatre companies, Ilbijerri and Perth’s Yirra Yaakin, alongside Sydney’s Moogahlin Performing Arts which operates the Yellamundie National First Peoples Playwriting Festival. Collaboration with the white artistic community, especially through Belvoir and mostly individual artists and dramaturgs, has been vital, though white writers dealing with Aboriginality have mostly learned that appropriation is not on. Enoch emphasises the totality (everyday, environmental, mythic) that is Indigenous storytelling, which is not an adjunct to life and politics, but an essential part of it. Enoch’s argument for opening up access to the infrastructure of Australian storytelling to diverse Indigenous voices remains as relevant as ever today. But his vision of storytelling goes beyond the theatre to the media, citing cases of “young Murri men breaking the law as a sense of giving yourself to a story; to be awarded public recognition, to get your face in the newspaper; hear your story on the radio or television,” and thus fulfilling negative expectations. He writes, “The obvious need for Indigenous people to control the means of representation is part of the reconstructive process from a culture of resistance to a culture of repair.” In that respect, there’s still a long way to go. 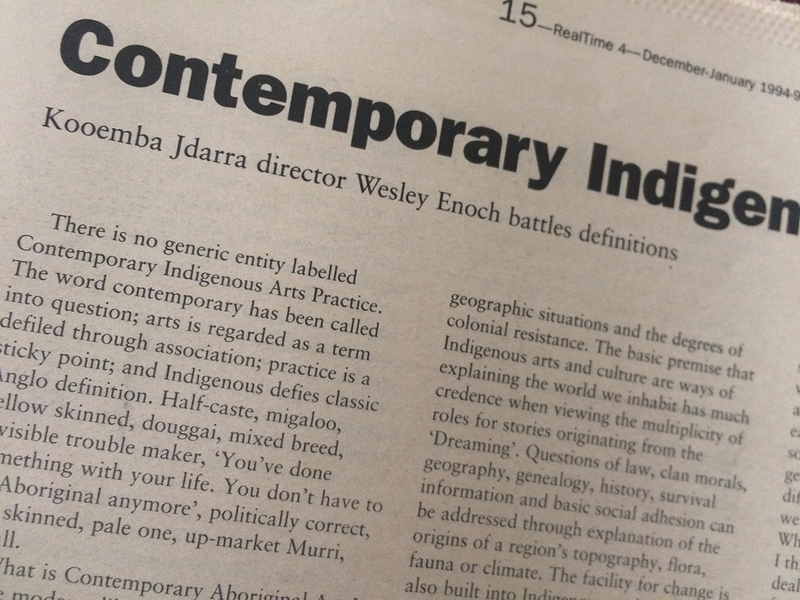 There is no generic entity labelled Contemporary Indigenous Arts Practice. The word “contemporary” has been called into question; “arts” is regarded as a term defiled through association; “practice” is a sticky point; and “Indigenous” defies classic Anglo definition. Half-caste, migaloo, yellow skinned, douggai, mixed breed, invisible trouble-maker. ‘You’ve done something with your life. You don’t have to be Aboriginal anymore,’ politically correct, fair skinned, pale one, up-market Murri, Myall. The meaning of ‘contemporary’ without heritage? What is Contemporary Aboriginal Art? In the modern dilemma of urban Aboriginality there remain many questions of authenticity in terms of the creation and maintenance of traditionally-based social structures devoid (through waves of psychological and physical attack) of the traditionally cultural means to create meaning. The destruction of dance, song, story, language etc through the process of invasion and systematic genocide, has precipitated a new wandering amongst Aboriginal generations who have not experienced the first-hand traditional heritage that we are expected to have in order to claim the mantle ‘Indigenous.’ Nor do we possess the cultural capital to fully analyse the dominant discourse in terms of appropriate change and acknowledgement of culturally specific development throughlines. The character of contemporary Indigenous cultural meaning-making maintains a diversity reflected in traditional experiences. The diversity is exemplified by the sheer numbers of Indigenous languages spoken on the continent, the variance in geographic situation and the degrees of colonial resistance. The basic premise that Indigenous arts and culture are ways of explaining the world we inhabit has much credence when viewing the multiplicity of roles for stories originating from the ‘Dreaming.’ Questions of law, clan morals, geography, genealogy, history, survival information and basic social adhesion can be addressed through explanation of the origins of a region’s topography, flora, fauna or climate. The facility for change is also built into Indigenous traditional meaning-making structures. The Great Horse Gallery at Laura in Far North Queensland shows the first sighting of the horse rendered in what would be called traditional design; similarly a dance from Bathurst Island depicting the gunning turrets stationed on the islands during WWII shows interpretive traditional enacting as a more modern experience; or the creation of explanatory myth-like structured stories for the coming of alcohol or money or AIDS or the Nissan four-wheel drive bespeaks a flexibility to accept and explain environmental changes through a facility of ‘New Dreaming.’ I argue that this ‘New Dreaming’ is legitimated (by Middle Australia) as Indigenous through its continuity of vocabulary and sense of inclusive expansion, in that the obvious bases of language, form and geographic context remain unchanged whereas content is the responsive element. There is an inherent need for storytelling and the continuation of oral traditions of explaining the world that we, as Indigenous people, inhabit. This is not a uniquely Indigenous experience. In fact if history read more like an injection of technologies into Indigenous cultures, as opposed to the denial of access coupled with an outlawing of cultural practices, I believe that the more embracing and culturally analytical use of technologies that we are starting to see now would have emerged earlier. Video and telecommunications technologies are now used by family members [to keep in touch with those] in detention as a strategy to combat the high number of Indigenous deaths in custody. First Nations people in North America are starting to use hi-tech virtual reality to create environments depicting ancient stories of creation as teaching tools for their young people. The imperative to make meaning through story is so intense that it has led to a two-sided manipulation of the media, which has provided the greatest access for Indigenous people to tell their stories. On the one hand, Middle Australia has used the media to maintain its dominance, while on the other, Indigenous Australia has distorted its image to fit into this self-fulfilling projection of negative stereotypes. Many young Murris I’ve worked with talk about an urban initiation based on breaking the law as a sense of giving yourself a story; to be awarded public recognition, to get your face in the newspaper; hear your story on the radio or television. Denial of access to storytelling or meaning-making structures encourages actions such as rallies and marches, and inspires thoughts of civil war or rebellion (where it is fighting for the right to write history in the winner’s image). The obvious need for Indigenous people to control the means of representation is part of the reconstructive process from a culture of resistance to a culture of repair. There should not be a sense of reclamation of traditional meaning-making without analysis, but in most cases for urban Murris this is impossible because of the amount of damage sustained in the last 206 years of resistance. I fear that if we try to recapture and appropriate what we interpret traditional cultures to be, we run the risk of denying the experiences we have had throughout the process of invasion. The instigation of internal cultural analysis must be one of our first steps in any form of reconciliation, be that with Middle Australia or with ourselves. Issues such as men’s business and women’s business, gender construction and its impact in areas such as domestic violence and homicide, the pressure to homogenise Indigenous culture (the appropriation of dances, language, songs and images from one clan to fill another’s void), and the need for role model development should all be analysed. In many cases traditional values are appropriated as an excuse not to face opposition or to avoid exposure. There is no sense in which this work can be seen as inauthentic. Our experience as Indigenous people cannot be devalued because of the colour of our skin, the choice of materials for our art-making, our education backgrounds, geography etc. There are many different performance interpretations of our Indigenous experience based on these factors, but none being more Indigenous than another. The role of contemporary Indigenous meaning-making through arts and cultural endeavour is a continuation of ancient structures of storytelling with an ongoing review of language, form and geographic context as well as content. Kooemba Jdarra (which means “Good Ground” or “Sweet Land” in the Turrabul group of languages from South-East Queensland) is a company dedicated to these debates through live performance. Kooemba Jdarra came from a groundswell of support from Indigenous artists and communities for a company to explore that perspective in an all Murri Mura environment. The Cherry Pickers, the company’s inaugural production directed by Lydia Miller and featuring seven professional Queensland Indigenous performers, sets out to tell a specific experience of Indigenous survival. The text has been appropriated and interpreted to reflect a 1994 Indigenous perspective, to play the dual roles of celebration of story and exploration of meaning and historical roots for our Murri Mura community in South-East Queensland. The further appropriation of performance form joined with Kevin Gilbert’s appropriation of English and the conventional playwriting format basically facilitates the storytelling and in no way undermines its credibility as an Indigenous story. The script is used as a vehicle to publicly discuss issues of cultural appropriation, health and mortality, alcohol dependence and economic disempowerment. At the root of this is the acknowledgement that all culture must appropriate symbols, forms, language, stories, etc to create meaning tempered by a specific protocol and respect for our community. The Cherry Pickers is a process of experimenting with material and perspective, an ongoing dialogue between community and artist about actively shaping our cultures, responding from within not without. The ability to generate and comment on our cultural development is at the heart of contemporary Indigenous arts and at the core of Kooemba Jdarra.